The Hot Chillys PeachSkin Roll Down Turtleneck is a mid-weight base layer thats peachy-soft. Made from the Hot Chillys micro polyester fabric, the Roll Down has a lightly sueded, peached face for increased softness and warmth. Flat seams add to the strength and comfort of this top. A fitted shape adds to the allure of this layer. "Is this Spring Green the same as the Killtec ski jacket's spring green color?" "Because these two items are from different manufacturers the colors will not be an exact match to one another. " "Is it supposed to be a snug fit? So this would be comparable to the 'silky thermals' to wear under a shirt? Thanks. First time skier..."
"The Hot Chillys PeachSkin Roll Down Turtleneck is relaxed fit. 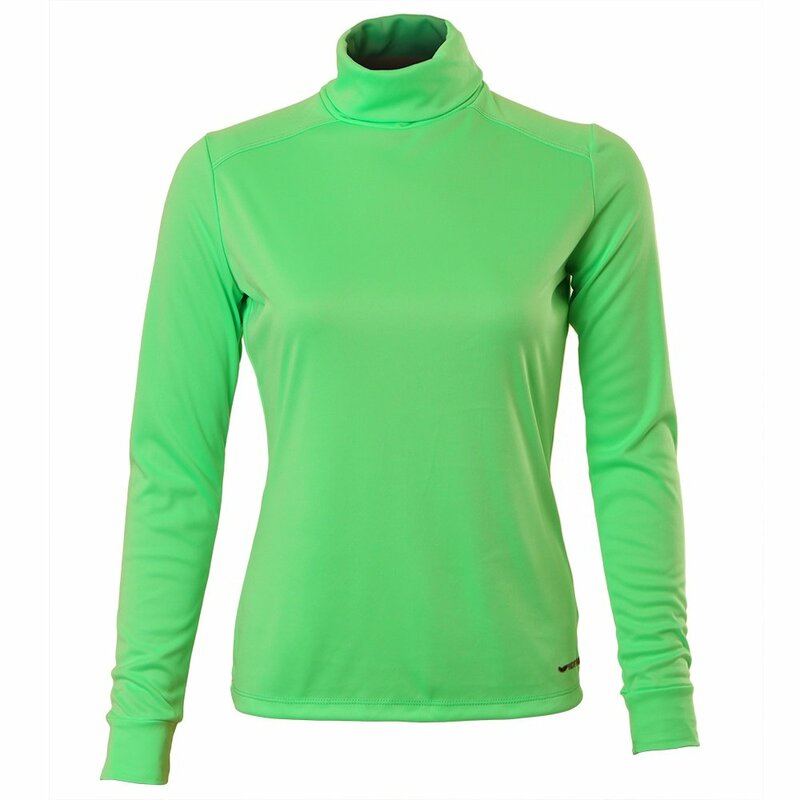 It can be worn as either a baselayer or midlayer. PeachSkins provide a good degree of warmth with the soft "peached" finish. Hope this information helps! " Love this color,will buy again,if it ever wears out. I wear these shirts under others or alone,they are stylish and warm,don't ride up when layered. I will buy this product again in another color. First layer under ski clothes. Under scratchy sweaters. Not soft at all. Itchy. I sent it back. Great color and fit with this Hot Chillys Turtleneck. I like that the neck roll can fold over, go up over my chin, and look ruched. I have one in 4 colors, three in black and two in white. This Hot Chillys turtleneck is my first choice to wear under sweaters and vests, and single layer under my one piece ski suits. It&#039;s true that the neck does not fold over and stand up like a stiff cotton shirt, but it does cling to my neck, drapes attractively (a more dressy look), and is warm. I wear frequently as an outer later. I would like a nice forest green and silvery gray, and bring back the slightly heavier weight version. My first yellow-green shirt still looks like new after 5 years. The color is great and the material is soft, but the turtleneck does not live up to its name. It does not stand up. If that is how you like 'em this is the one for you. If you want it to hug your neck, find another.